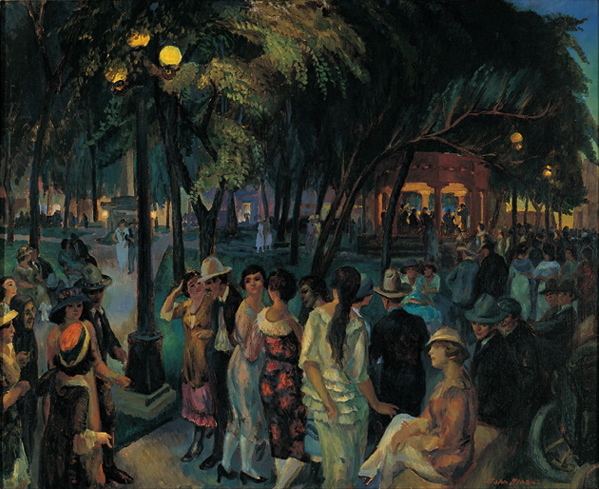 John Sloan (American, American Realism, 1871–1951): Music in the Plaza (Plaza, Evening, Santa Fe), 1920. Oil on canvas, 26 x 32 inches. New Mexico Museum of Art, Santa Fe, New Mexico, USA. Image: © The New Mexico Museum of Art. © This artwork may be protected by copyright. It is posted on the site in accordance with fair use principles.